Habitually cleaning out your closet is a good practice. You can turn items you are no longer wearing or did not wear into funds that can go towards new pieces. We all like to have that new new! This is also a great way to prevent buyer’s remorse. There are so many apps/sites to sell, buy, and trade clothing. I use eBay, Poshmark, and Mercari at the moment. I got into this habit after I was studying abroad for a year and could only take a suitcase of clothing. I realized that my past ways of being a clothes horse had got to go! It was more efficient to have less clothing and clothes that I am actually wearing in my closet.You can also sell electronics, makeup, jewelry, accessories, and shoes. Some people sell undergarments, which I would personally not buy from these apps lol, and bathing suits. If you sell a swimsuit, it is probably best not to try it on for the picture even if the hygienic liner is still attached- even though you more than likely already tried it on, that’s just my personal preference on the matter! I just read that the reselling is a $16 billion industry, so there are definitely opportunities to join the resell market as a large scale seller or to just get rid of a few items. If you just want to unload your items with minimal effort, there are some consignment style and full-service apps. My only experience with a full-service app was with the now-closed Threadflip. It was buzzing a couple years ago and I used the full-service while I went back to school for summer classes. I sent in quite a few name brand formal pieces in like new condition. Plus: The company took professional photos of the full-service items and listed prices. You can also list items yourself to your shop, and I sold a few that way. Minus: For the items that that they did not accept in the clean out bag, I had to pay a $15 return fee and they took a little bit to get them back. I then sold them on eBay. In addition, I was not able to control the full-service item prices and the marketplace lowered them until they sold. After the listing fee and Paypal fee were deducted, I got low payments, try $10.80 for a BCBG MaxAzria bandage skirt and $20 for formal Jessica McClintock dresses. Needless to say people got great steals! I don’t know what the experience is like with the other popular full-service apps, but I think I will stick to the post yourself marketplaces. The choice is up to you. What you have to consider is if you don’t mind getting less for a one-step process or quick $. Twice functions like a digital resell shop, and you get quick money. All this app requires is for you to send in your items. You receive a prepaid bag and label and the marketplace pays you thrift shop prices for the mailed in items. Afterwards, they sell the items for the pricing of their choice. This is an instant gratification process, but not necessarily the most lucrative. Reviewers say this is an easy tool for closet clean outs. There is also ThreadUP which is quite popular as well. On this app, they also send you a bag to fill free of charge. Then the company takes professional photos of the items and posts them. Once your item sells, you receive up to 80% of the resale price. eBay– I used to only use eBay, but I started using some other marketplaces. Plus– there are a ton of users on eBay worldwide. I have made a lot of sales over the years. You can use eBay as app or the traditional site. Minus– If you list the item as an auction, it goes on for 7 days. On other apps you could make a sale much quicker. Also, a buyer could buy the item and not pay nor return messages. If this happens you have to wait a couple days to file a case and then a few more before you can close it and re-list the item. 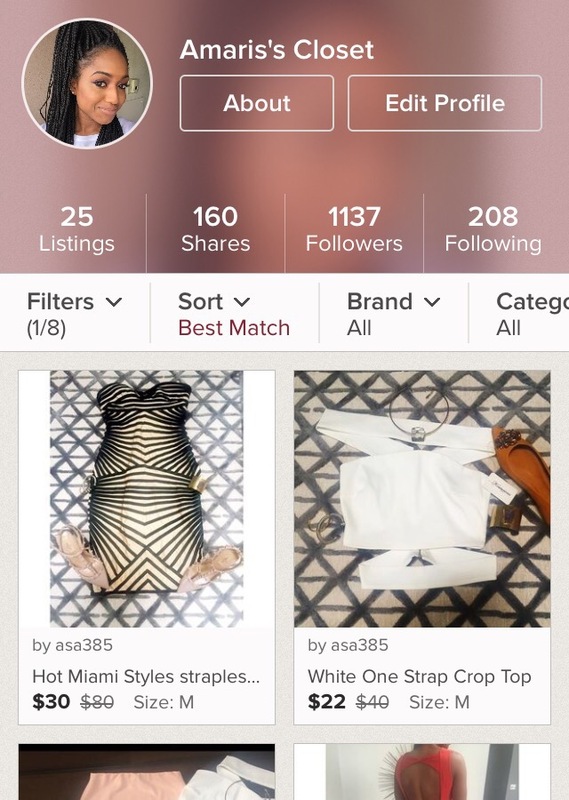 Poshmark– It is more of a social community than just an site/app to sell clothing. You create a closet and most ‘poshers’ include personal photos and about them sections. I have come across users who have become friends and met up from using the app. The key to this marketplace is to be active to gain followers and thus buyers. Some people trade clothing on the app, but the action isn’t supported by the app. My closet is @asa385. Plus: It is easier to get followers than social media. You can share other people’s items, follow closets, comment, and submit items to the themed parties that happen three times a day. Minus: The app takes 20% of the selling price for items over $10 and $2.95 from items under $10. This leads to a lot of offers from buyers and the reference to other apps that don’t subtract from sales. If you want minimal engagement than this might not be the app for you. Plus– Selling products is free and I have had more sales than on Poshmark so far. Shoppers should get better deals due to the lack of listing fees. 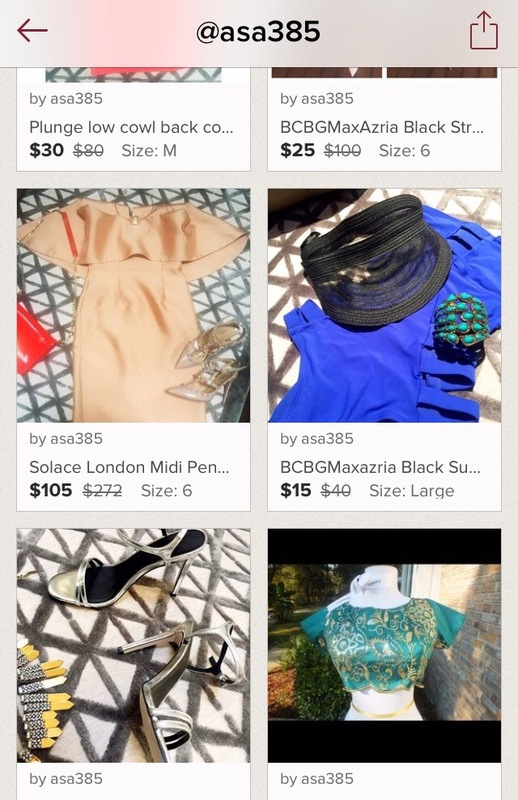 Minus-The marketplace is not as aesthetically pleasing as Poshmark nor as community oriented. There is less emphasis on branding your own closet, but these factors are up to user discretion about what they prefer. Presentation is key– It is vital to take great photos that show the item well. Buyers will want to clearly see the item and how it looks on. If the site allows, you can include stock photos from the site you originally purchased the item. You could also include a photo of you wearing the outfit if you have worn it or you can do a photoshoot. If you include a stock photo, definitely also include a photo of the actual product. Trust me, buyers will ask for one. If you think about it, you would definitely want to see the actual item that someone was selling because they are most likely not the original retailer. It is good idea to wash, iron, or dry clean the item beforehand to ensure the item looks its best. Before I used a mannequin but I just started creating outfit looks, which gives a taste of your personal style and is eye-chatting to shoppers. Thorough descriptions– You should include a few photos, select a category, and write a description with a good bit of product information. It should include condition, where you bought the item, brand, sizing, and original price. If it is too skim, you will get a lot of questions from buyers in addition to price point inquiries. Good Resell Price– By this I mean a price that is adequate for the item so more than likely less than you purchased the item for especially if it is used. You have to decide based on the amount of wear how much to deduct. You should also include the original price. It’s important to remember people can easily look up the original price or current price of an item so you don’t want to raise question marks if your price is seemingly too high. Be ready to negotiate! Great Packaging– When you finally make a sale, you want to ship the item in an appealing way to the buyer. This includes tissue paper, a handwritten thank you, and if you want to be fancy, some ribbon as well. The presentation can definitely increase the rating from the buyer. Another great shopping tool is Ebates.com, which allows you to get $’s back for shopping online. Sites like ASOS and amazon are eligible for percentages back. In addition, I always check retailmenot.com to get discount codes so imagine if a clothing brand works with both pages!